Fancy a cuppa? at Vane showcases a plethora of artwork by artists and community groups in conjunction with the Newcastle City Councils Art Team. Curated by students Lucy Chenery and Sofie Scholten, the project seeks to celebrate and showcase community art, but like most community projects there is an underlying agenda. In this instance, those who for the most part are not catered for by larger art institutes are encouraged to get involved with artists and others in their community to try and enrich their cultural heritage. Whilst the intentions are great, the age old question of ‘does that make it art?’ rears its head. Yet it is the curation of the work that demands the viewer to take note. Group shows often take one of two forms: either the work will be based on a particular subject or the curating will be based on a shared sensibility of those involved. Whereas the first looks to set a concurrent theme, the latter resists this temptation in an attempt to open up creative output and audience interpretation. Perhaps this is where Fancy a cuppa? leans in a slightly new direction. With work ranging from areas such as Blakelaw, Scotswood, Rye Hill, Newbiggin Hall, Newburn and Throckley, the exhibition is split into separate sections. Each has enough space to allow the viewer to contemplate the work as an independent piece, whilst at the same time maintaining a narrative flow that suggests these areas could not only be the same place, but anywhere in the UK. It is interesting to note that the majority of workshops run by female practitioners follow the lines of the more conventional idea of community art. As part of the Newbiggin Hall project residents of a sheltered accommodation took part in a sewing group, creating embroidered pieces that answer the question ‘what advice would you give to your younger self?’. The same project also saw the church and local community create a large scale silk banner, which hangs from ceiling to floor in the exhibition space. Whilst the Newburn and Throckley group developed the piece ‘Memory Petals’ (2016), which uses a collection of petals and sound equipment to delve into the historical links the area has with the River Tyne. However, it is the work by local model maker Ken Harkiss, who created a replica of Newbiggin Hall, and practitioners Aaron Guy and Robert Parkinson, Scotswood project, where the artist’s hand can be clearly seen. Texts line the wall in the Scotswood section, with each touching upon a different aspect of the area and its community. They oscillate between three pillars: artists, Scotswood Centre and the New Tyne West Development Company. A banner on the wall, pinned by wooden struts, exclaims “imposing architecture will not change a mindset”, denoting not only a political stand but also a more masculine approach. Due to the variation of artworks on display and approaches taken, a dialogue opens up, probing us to define what we perceive to be community art and what its intrinsic value is to the wider art audience. Perhaps this can be answered amongst the several works that encourage you to assume the role of local resident and get involved in some of the activities, which provides the visitor with a tangible link to the work placed on the walls around them. 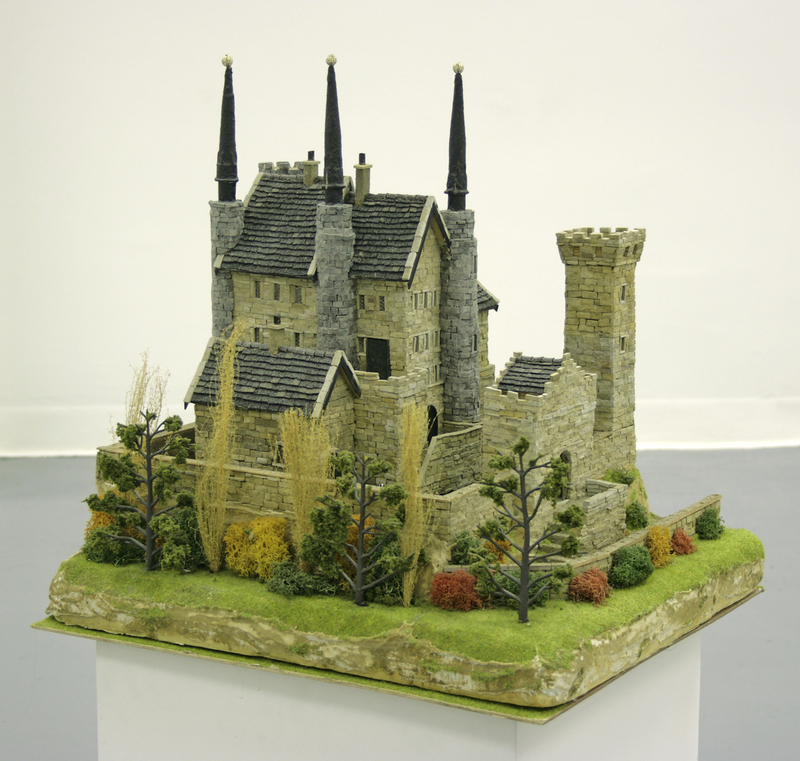 Image: Model castle, Ken Harkis, ‘Fancy a cuppa?’ (2017). Photo courtesy of Vane.